Ruth O’Leary is an experienced embroiderer with many years experience in designing and creating embroidered artworks, including bespoke pieces on commission. Ruth has exhibited in a range of forums, including private displays, public spaces and galleries. 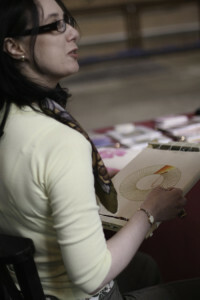 Ruth uses a variety of embroidery techniques in her work, depending on the requirements of the piece, but specialises in needle painting in long and short stitch or split stitch and goldwork, often using appliqué in fabric or fine leather. She enjoys the demands of working to commission. Although Ruth works to her own original designs, and develops each unique project from start to finish, she enjoys discovering the client’s requirements, and the fresh ideas that develop from them. Ruth has been a member of the Embroiderers’ Guild for over 20 years, and is a past Chair of the Newcastle-upon-Tyne branch. If you’re interested in finding out more about Ruth’s work or would like to discuss commissioning a piece of unique textile art, please get in touch. An illustrated interview with Ruth on her work as an embroiderer. A PDF of the interview is available to read. This article describes the successful exhibition held in May 2008, and includes photographs of Ruth’s work. One of the UK’s leading embroidery magazines, CrossStitcher, contained an exclusive interview with Ruth. The June 2009 issue featured My life in stitches, asking Ruth about her designs and the techniques she uses, and her attitude to her life and work. A PDF of the interview is available to read. I am a self-taught hand embroiderer and textile artist based in the North East of England, and have been sewing since I was a child. I have always loved fabrics and threads, and the way these simple materials can form beautiful objects. I am interested in both the formal organisation of space and in natural forms, and much of my work uses geometry as a basis, either in a pure form or as a way of structuring natural elements. I’m also inspired by history and the heritage of the British Isles, and the use of Celtic motifs devised by unknown artists centuries ago. To me, these all represent the underlying harmony of nature, and the order in seeming chaos. I am particularly interested in the ways in which centuries-old hand embroidery skills can be used in the modern day, especially the subtle use of colour in needle painting or thread shading techniques, and the use of medieval Opus Anglicanum techniques – goldwork and split stitch – in my own contemporary designs. This requires considerable craft skill, an eye for detail, and a good deal of patience. My embroidery is central to my life, and I constantly notice surfaces, textures and forms that inspire me. The finished pieces are part of an ongoing development, with themes and messages joining and reappearing within my work, always moving towards something new.